Infect with passion. Decode the arcane. Encourage the unencouraged. Research is teaching. These are among the “effective professor mantras” Utah State University physicist David Peak mutters to himself each day as he walks about campus. Nuts or not, Peak’s approach seems to work. The physics professor was named the Carnegie Foundation’s professor of the year for Utah Thursday during ceremonies in Washington, D.C. Peak is one of 40 professors from across the nation honored as the best in their states. The awards, from the Carnegie Foundation for the Advancement of Teaching and the Council for Advancement and Support of Education, recognize outstanding professors for their commitment to teaching. Nine of Utah’s last 15 Carnegie Professors of the Year have been from USU. “I’ve mentored many students – both high achievers and those with lower GPAs – and all of them attribute their eventual career successes to their undergraduate research experiences,” Peak says. 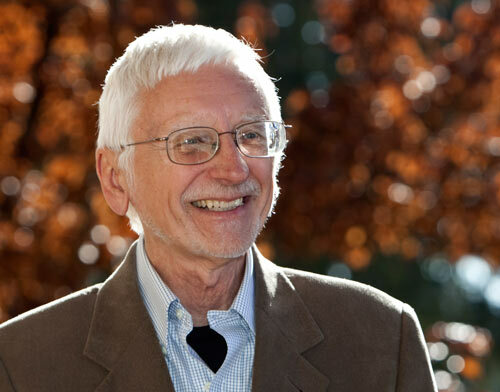 Last year he and his wife, social work professor Terry Peak, established the “Peak Prizes in Undergraduate Research,” which funds awards to students from each of the university’s seven colleges and from a regional campus. More than a decade ago, Peak established a “scholarship boot camp” to equip outstanding undergraduates with the skills to pursue national scholarship opportunities. Since 2001, his boot campers have received a Rhodes scholarship, a Rhodes finalist citation, a Fulbright student scholarship, a Marshall scholarship, two National Science Foundation graduate fellow recognitions and 14 Goldwater scholarship recognitions. For Peak, “all” also means eliminating gender bias in mathematics and science at USU. USU alum and Rhodes Scholar Lara Anderson, now a postdoctoral fellow at the University of Pennsylvania, says she was particularly grateful as an undergraduate for Peak’s “cheerful viewpoint that gender didn’t matter. “In my own experience in physics research and teaching, I have frequently thought back to the way that [Peak] explained complex concepts, the enthusiasm with which he taught and how he mentored and supported his students,” she said. USU graduate Jennifer Albretsen Roth, a Goldwater Scholar who was named USU’s 2009 Scholar of the Year, is pursuing graduate study at Oregon State University. She remembers Peak’s humor and genuine love of teaching. Past USU Carnegie Professors of the Year are: Lyle Neal, animal science (2007); Bonnie Glass-Coffin, anthropology (2004); Jan Sojka, physics (2002); David Lancy, anthropology (2001); Mark Damen, history (1998); Sonia Manuel-Dupont, English (1997); Ted Alsop, geography and earth resources (1996); and Frances Titchener, history (1995). Click to read more about USU’s Carnegie Professors of the Year: http://www.usu.edu/carnegieprofessors/.